Want to win some jewelry? Check the giveaway details at the bottom of this post! Editor's Note: In order to continue producing Holl & Lane, we rely on amazing partners (who we truly believe in) to run ads within our pages. We're so excited to introduce you to the 10 amazing partners who have allowed us to create Issue 14 for you. We encourage you to dig a little deeper into their stories and learn more about the products and services they create. Without them, we wouldn't be able to keep doing H&L. Why and how did you start your company? My love for crafting accompanies me since my teenage years: creating jewelry, sewing my own clothes, painting… my hands were and are, literally, always moving. The love for photography soon became an obsession, and smaller photo shoots transformed into elaborated photography series. With creating crowns and props, the dream of running my own little business manifested. After a one-year internship in a media agency and finishing my bachelor’s degree, I just started. There were a few tough times that need to be mentioned, too: starting the master’s degree, having a second job for earning the money, plus the long working hours for Refined Bohemia as well. But giving up has never been an option. My main mission with Refined Bohemia is to give women self-confidence and an item to store their stories. I get a lot of meaningful requests for jewelry: I crafted friendship bracelets for two women, who went through the death of a father together and a request for a “something blue” to celebrate an engagement. My designs connect my story with the stories of my customers. Getting to know all the strong women makes my heart cry for joy. How do you hope your brand affects women’s lives? I hope that wearing the jewelry makes women happy. Wearing a special piece of jewelry tells a story. With the knowing that my jewelry becomes a memento for friendship, support, or their own personal roots, all the hard work paid off. Plus, I do believe that fighting for your own dream impacts others to do the same. I hope that my story empowers young women to create their dream lives with their own hands, even if they are told to float with the current. We cannot get enough of the modern, bohemian style of your jewelry. Where do you draw inspiration from? "Inspiration is the shyest being of all. It does not impose, it does not scream for attention. It is just there. Only those who don’t seek for it in compulsion, only those who go to places no one else ever paused will find it." The surrounding nature is my main inspirational source. Long walks through the woods while fog is all around. Nature and soul are perfect for gathering new ideas. 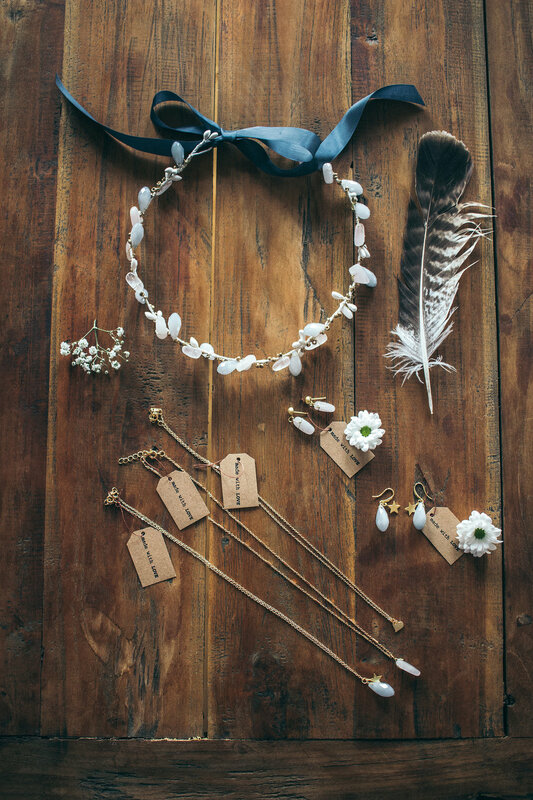 What you’ll find at Refined Bohemia are designs crafted with materials right from mother nature’s heart: real pearls, crystals, and pendants that remind of flowers or branches. Another source of inspiration is the world of myths and stories I dive into when reading books. I often stroll over vintage markets and look out for special pieces of silverwork and unique pendants that I can work into my designs. Often it’s one special pendant or theme that inspires a whole collection. There are some more sources that need to be mentioned here, too: one of the most important tools is Pinterest. Even if I don’t look for something special, this platform has a huge impact to my creations. Another important source is a good long talk with a friend. Seeing the own work from a different point of view. Knowing what others appreciate is so important to change perspective. The holidays are coming up quick! What are your favorite pieces for gifting this season? I am a huge fan for gifting personal things, mostly handmade or with a deep connection to the life of the presentee or something that reminds him or her of beautiful moments you lived through together. I crave for beautiful packaging. Gift wrapping has become a major part of my gifting process. You can also see my love for packaging in the way Refined Bohemia jewelry is packed as well. The Finsbury Road Necklace has become the generation-spanning piece of jewelry, since I gifted it to my sister, my mom, and my grandma. Many customers prefer necklaces that are easy to combine with the existing collection or gift cards to play it safe. To win a $30 shop credit to Refined Bohemia please check out THIS POST on our Instagram page.